Within seconds of arriving at the salubrious resort in Cascais, my three-year-old twins were whizzing around the Martinhal reception area on the hotel-provided bicycles. High on sugar from the lollipops they’d sucked on the flight from Dublin to Lisbon, to help with their little ears, Jackson and Mya were in full play mode — despite the time approaching 11pm when they would usually be patrolling the land of nod. The male receptionist checking us in was not in the slightest bit perturbed, indeed he suddenly produced two bags full of toys which only added to the smiles and squeals of delight. And he seemed genuinely pleased the kids were so excited when their gaze caught the ever-changing colours of the dome on the inviting indoor pool in front of the main entrance. This is no ordinary luxury resort as the children are actively encouraged to lose their inhibitions, be seen and heard and unlike most plush establishments, as soon as you step through the doors at Martinhal, Cascais, the emphasis is on each member of the family having a fun-filled five-star experience. Less than 24 later, the twins, normally so reticent about being away from their parents, especially on holiday, were only too happy to attend their first disco — a Pirates and Fairies themed party which takes place every Monday in the Ideas room — on their own, while my wife Kate and I waited close by in the bar area. When they needed to come out for a toilet break, Jackson and Mya, their cheeks flush from dancing and playing games, had beaming smiles across their faces and seemed totally at ease with the specially trained staff in charge of children’s entertainment. It was to be the conclusion of a major day of excitement and adventures in their little world as it started with an al fresco breakfast in the main O’Terraco restaurant, where following some cereal and toast, they visited the supervised kids corner with arts and crafts keeping them occupied while my wife and I were able to enjoy our coffee in the sun — all within sight of the twins. Then, it was on to the kids club which is situated on the ground floor of a converted golf club house. Martinhal bought the property from a golf resort just over five years ago and it was decided the former club house would host the main children’s area of the hotel below the M Bar, an alternative restaurant where you can choose Italian and Portuguese styled food for lunch and dinner and also order it for takeaway. There is a full bar menu with the usual cocktail and smoothie choices and Sagres rather than Super Bock is the main draft on offer. The kids club house (Raposinhos (two to five years of age) and Fox Club (six to 10 years of age), spanning 700sq m, are compliementary, has attentive and enthusiastic staff, and is packed full of toys, educational activities and there is even an indoor climbing frame and slide. Each sesssion has a different theme which is detailed in the newsletter on arrival. The resort caters for babies with their creche, and children well into their teenage years. 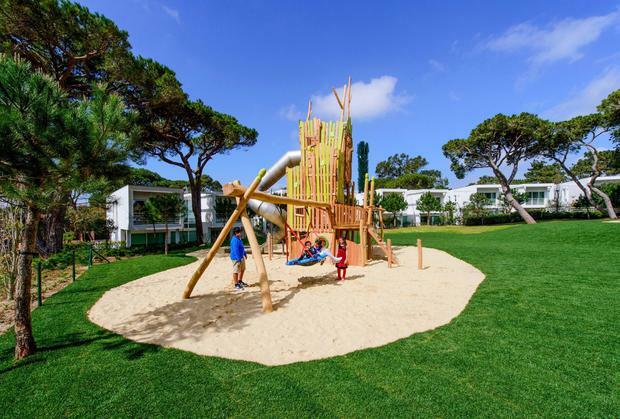 The kids club also allows the adults to completely unwind for a few hours, whether it is a quick game of golf or walk on one of the two Championship courses — Quinta da Marinha and Oitavos — adjacent to the hotel, visiting the lovely town centre of Cascais, a swim and a read at the pool hangout, yoga, a bike ride along the beautiful Estoril Riviera or a gym workout inside the ultra-modern Finisterra Spa where you can also reward yourself with a relaxing treatment, jacuzzi and sauna. Indeed, the spa has its own pool which can be enjoyed both inside and outside in a fantastic setting. 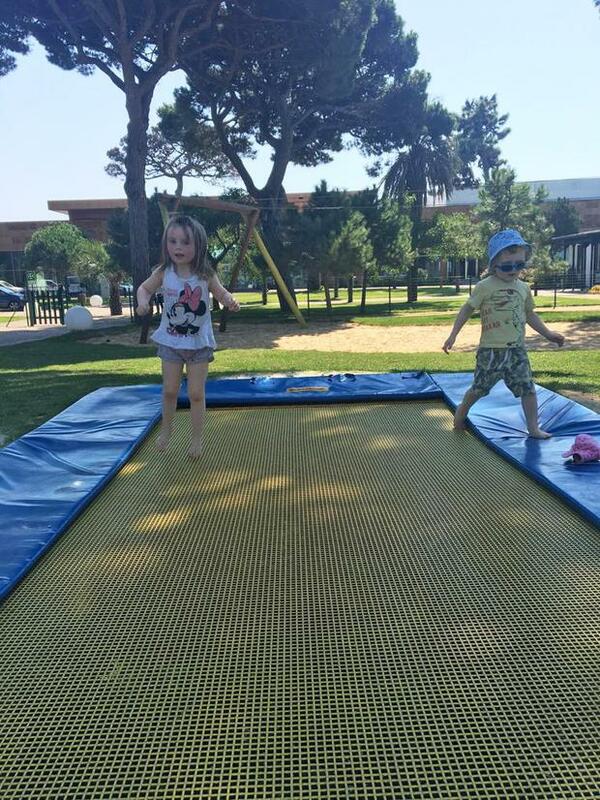 While the kids club is great for the odd session, the ethos of Martinhal is family fun together and so the play park, opposite the hotel reception, is the perfect place to join your little ones on the trampoline or kangaroo jumper before pushing them on the swings, watching them soar to the top of the climbing frame or fly across the zip line. It’s also a lovely place to have a picnic on the giant bean bags scattered around the park and that can be ordered from the M Bar. Beside the play park is an artificial grass five-a-side football pitch, where you can sign up for coaching courses or tournaments, and a basketball court to shoot some hoops, while just in front of the kids clubs is Martinhal’s famed VW Beetle, a firm favourite with all the children, along with table football and table tennis. The pool hangout area at the back of the resort is spacious with plenty of sun loungers and hosts a refreshing main pool, a children’s paddling pool along with the hugely popular splash zone. There are further games and activities for the kids in the tented shade, should they become bored of the water. As dusk descends, you have the choice of O’Terraco or the M Bar for dinner. O’Terraco may be the more sophisticated choice with delicious gourmet cuisine and a fantastic, detailed wine list but once again the children are always catered for with their own varied menu, plastic cutlery, kids corner and understanding restaurant staff who are only too happy to overlook the odd tantrum and if need be, box up the parents’ dinner to take back to the room. And realising that the night is still young when the kids go to sleep, the Lounge Bar offers a cocktail service and nibbles (Time for two under the stars) to be enjoyed on your terrace/balcony with no service charge. The rooms, which are all kids friendly in terms of safety, are ultra-luxurious and modern with super king-sized beds, all your sought after amenities, such as a Nespresso coffee machine, and a large bathroom which includes a huge deep bath, separate rain shower and double sink. For children, Italian designed bunk beds are available but for a larger family, there is the option of an inter-connecting room allowing the kids to be in one room with their own ensuite. 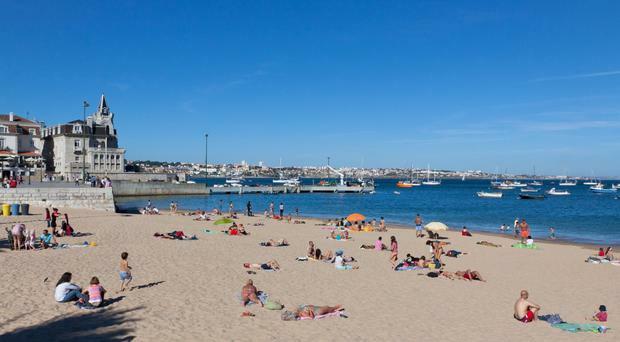 Cascais is situated about 25 minutes from Portugal’s capital Lisbon and is on the Estoril Riviera. The town is synonymous with royalty and Martinhal still has an outhouse which was once used by the monarchs and it can be hired out for corporate parties. There are regular shuttles from Martinhal into Cascais (15 minutes) and it’s well worth taking a walk through the delightful streets, even if it is just to pick up some groceries or experiencing the delightful ice cream at Santini. But if you don’t hire a car for a day or two, and you can from reception for about £125, then you would be missing out on breathtaking scenery, long and winding narrow roads, stunning towns and villages along with incredible soft sand beaches, especially at gorgeous Guincho. It’s a surfer’s paradise with the waves strong and huge and while the kids loved the breakers, you can only go into the water a couple of feet due to the tremendous pull. The most western tip of continental Europe, Cabo da Roca is just a short drive from Cascais, you can cycle to Santa Marta Lighthouse, but head into the mountains, close to the majestic Sintra and when you come down you’ll find authentic Portuguese beaches with those magnificent caves and arches. Well worth the drive and along with Cascais and Martinhal, it really does offer a serious alternative to the Algarve. A complete holiday treat for the entire family. * Where to stay: Martinhal Cascais Family Resort is situated 25 minutes from Lisbon. The Transport Secretary has announced the government will continue to subsidise direct flights between Londonderry and London.